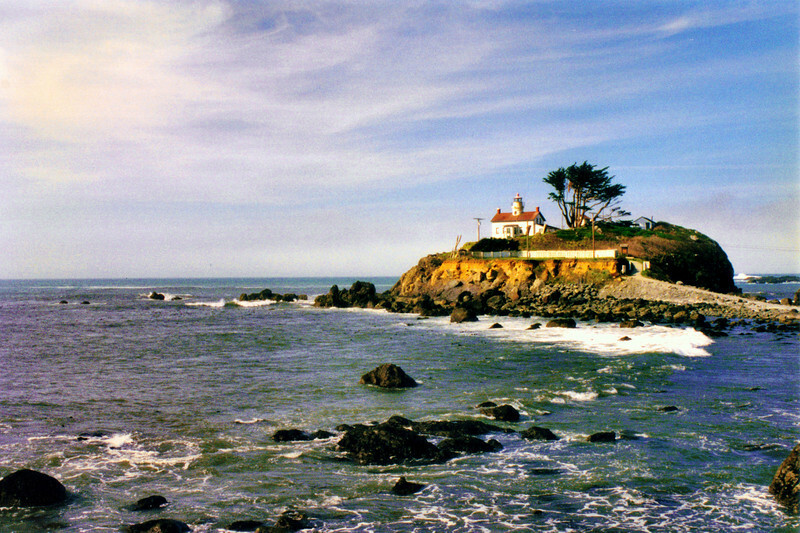 The Battery Point Lighthouse in Crescent City, California is one of the oldest lights on the west coast. Located 15 miles south of the Oregon border the harbor served as a starting point for the gold fields during the 1850’s and later as a port for the timber industry. The lighthouse has changed little over the last 150 years and is an excellent example of early west coast lighthouse construction. When Crescent City incorporated in 1854 it petitioned for a lighthouse to mark its harbor. In May 1855 Congress appropriated $15,000 for the construction of a station. The site selected for the lighthouse was a small islet at the harbor entrance. Luckily the islet was accessible on foot at low tide twice a day which made the transport of construction materials easier.